Some things are so important, yet so mundane. Wherever you gather a few swimmers together, you can be certain the subject of goggles will arise. And pool swimmers and open water swimmers often differ quite widely. 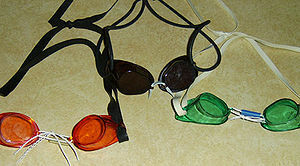 In pool swimming people often go for smaller goggles, either Swedish or goggles based on the Swedish design. For those who don’t know, Swedish goggles are the cheapest goggles you can find. They are made by a Swedish company called Malmsten and often sold under other labels such as Speedo, as Swedish Style Goggles. Indeed the Speedo double-pack from Amazon are good value since they come in a two-pack of mirrored and clear. They have no frills, just plain plastic with string as a nose guard, no rubber gasket or seal, usually no anti-fog. Some people literally can’t wear them. They can take days to get the fit right, with people going so far as to file down edges to get the fit correct. They are light and low profile. For those who can wear Swedish goggles, they swear there is nothing better and they never come off and are the most personalised goggles possible. However … as said above, some people can’t wear them or get them to fit correctly. They are not really designed to wear for extended periods of time like a marathon swim. And the lack of anti-fog is a problem. 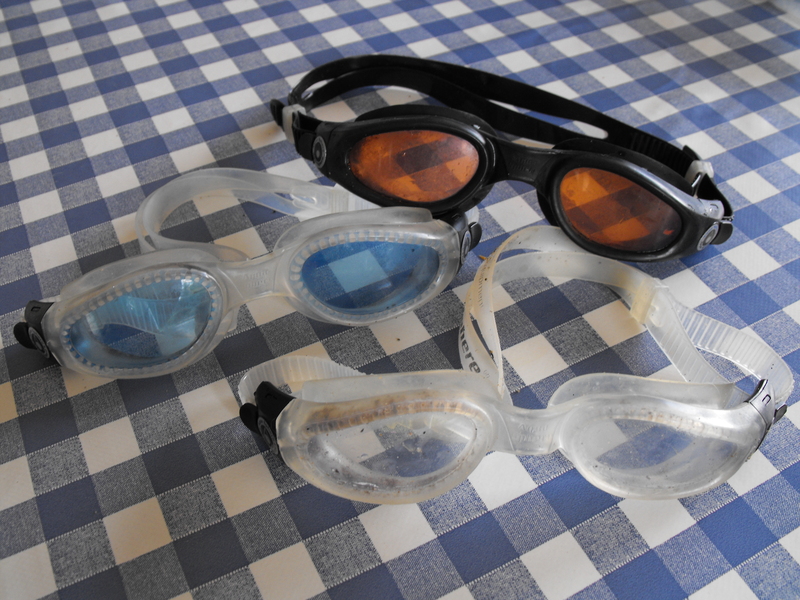 The growth in triathlons worldwide meant that pretty quickly there was growing demand for goggles for open water. Goggles that would stand up to rough water, be anti-fog, be easy to fit and comfortable for long periods of time and yet still be 100% watertight. Ease of adjustment is often a consideration. And then I finally found Aqua Sphere Kaimans. (Mainly because some of the other guys started using them). 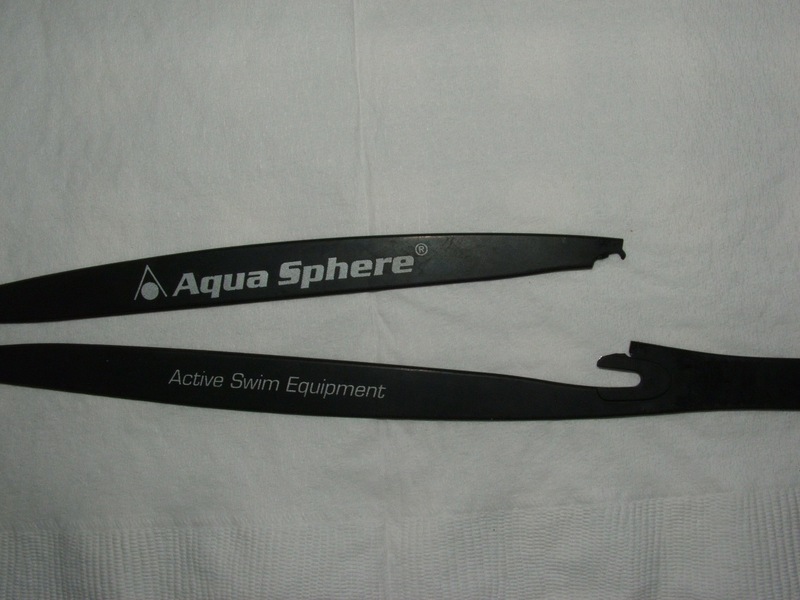 These were designed specifically for open water. They have good visibility, anti-fog, secure no leak, and most importantly, I can wear them for ever with no problems whether swimming the Channel, or doing a 24 hour pool swim. I have bought one pair of the mirrored ones, which had no anti-fog on them and were useless. I’ve used clear, dark and amber ones though. They come in different frame colours and different sizes, Junior, Lady, Regular and Small Face. They are also very easy to either loosen or tighten. 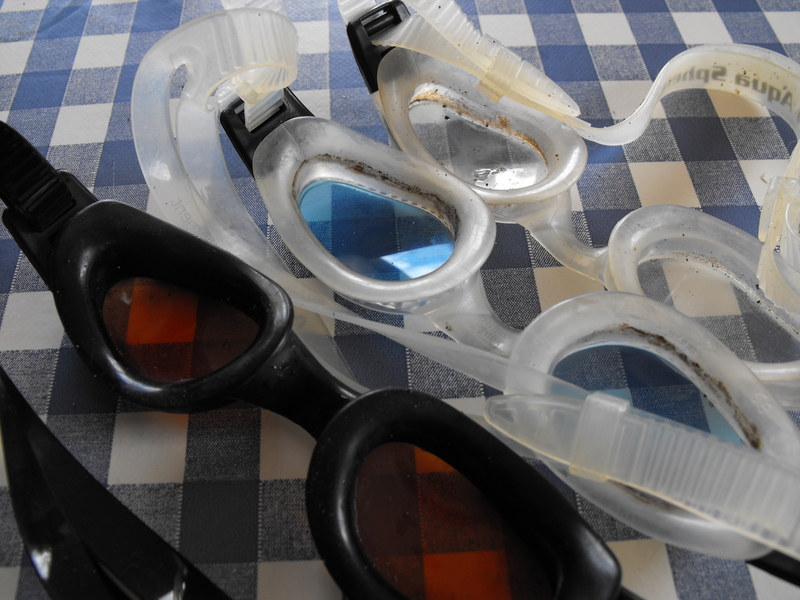 I prefer clear frames with amber or blue lenses for open water and clear or amber lenses for the pool. There was one problem with the some of the straps splitting at the back in the same place after six months, but I complained to Aqua Sphere and got a bag of straps in return. I get about 9 months to a year from a pair of heavy use. I’m good at remembering to rinse after the pool, but not after the sea, so they tend to grow a mold line inside the lenses. The Aquasphere Kaimans have been superceded by the newer Aqua Sphere Kayenne, which are slightly more expensive. The frame is lower profile, the visibility is still excellent. I’ve only used them in the pool so far. The box is better and the living plastic hinge should last longer that the Kaiman box before I have to duct-tape the halves together. I wore them for six hours yesterday and can report they are just as good. I’m struggling to understand, other than styling and box, why they are €4 more expensive. I know some of the guys like Karen Throsby use Blue Seventy Vision goggles, also designed for open water, and swear by those also, but I haven’t tried them, since Aqua Sphere work so well, I see no point in changing anymore. EDIT: I’ve since added another goggle review here and I haven’t used Aquasphere myself in a few years, though I still believe they are excellent open water goggles for those who prefer a fuller gasket-type goggle. Kaiman’s every time. Never need adjusting, don’t leak, stay fog free, don’t leave me with eye rings. Work from zero degrees to 20 plus degrees. And at 12 and a half quid, what’s not right? But…I also know those who swear by sockets or mini-masks. That’s it, Carl, rub in the cheap price over there. €17 here, that’s about £15? Mini-masks? Just say no. I mean, we have to have some standards as we stand there in our weird tans, goosepimples and grease. As regards weird tans…I now have a pale jammer shaped freckle free upper leg, a permanently speckled, freckled and tanned back and a pale belly. And underneath the blubber I am a man of steel! I still swear by Swedes, even after converting to open water. When I started doing lots of OW racing I invested in a couple pairs of B70 Hydra Visions – thinking they’d be more comfortable during longer swims, and that I’d be less likely to get hurt if someone kicked me in the face. The B70s are good goggles. But eventually I realized I just didn’t like them as much as my trusty Swedes. I “know” my Swedes, and they know me. They’re almost an extension of my face at this point. They never leak, they never fall off, they never break (esp. with an after-market bungee strap). A quick lick or swirl of saliva solves the anti-fog issue. If they get skanky I just toss them in the dishwasher – good as new! Contrary to conventional wisdom, if you’re “acclimated” to Swedes there’s no reason they can’t be comfortable for a marathon swim. I wore them for all my big swims this year (Tampa being the longest, at 8 hrs 59 mins) and had no comfort issues. I actually feel jealous that I can’t wear them. And I love the idea of throwing them in the dishwasher. I really think saliva would keep them fog-free for more than about 3 hours. count me as a loyal b-70 vision user. the lens does sit close to my eyes making it necessary to trim my eyelashes for long swims. At least it’s not a mask and you have to trim your nose-hair!